Maltese police believe the car bomb that killed Panama Papers journalist, Daphne Caruana Galizia, in October was triggered by a text message. Three men who were charged with the crime on Tuesday have pleaded not guilty. Caruana Galizia’s has criticised Malta’s government about its handling of the case. Maltese investigators believe a man charged with murdering an anti-corruption journalist set off the car bomb which killed her via SMS from a cabin cruiser out at sea, police sources said on Wednesday. Three men were charged on Tuesday over the death of Daphne Caruana Galizia, whose car was blown up as she drove out of her home on Oct. 16. The crime shocked the Mediterranean island and raised concerns among European Union lawmakers about the rule of law there. The three, named as Vince Muscat, and brothers Alfred and George Degiorgio, have all pleaded not guilty. Police sources said investigators suspected George Degiorgio sent the text message after receiving a signal from his brother Alfred, who they believe acted as a lookout. A boat has been impounded. There was no immediate statement from the men’s lawyers. Evidence gathered so far suggests the bomb was placed inside Caruana Galizia’s rented car while it was parked in an alley outside her house six miles from Valletta on the night before her death. Mobile phones were recovered from the sea in Marsa, an inland area of Valletta harbour, the sources said. Caruana Galizia wrote a popular blog which highlighted cases of alleged graft and targeted politicians in government, including Prime Minister Joseph Muscat, and the opposition. Her blog sometimes got more than 400,000 readers a day – more than the combined circulation of all of Malta’s newspapers. Shortly before her death, she linked Muscat, and his wife, Michelle Muscat, to payments from the ruling family of Azerbaijan that were hidden in secret offshore bank accounts. “In March last year, Al Sahra FZCO – a company incorporated in Dubai’s free zone – made a single payment transaction of $US1.017 million to Egrant Inc, a company incorporated in Panama in 2013,” Galizia wrote in April. The “daughter of Ilham Aliyev, ruler of Azerbaijan,” was “the ultimate beneficial owner” of Al Sahra FZCO, Galizia added, and Michelle Muscat owns shares of Egrant Inc.
Al Sahra FZCO is an oil and gas company, and Azerbaijan’s national oil company recently became a shareholder in Malta’s new power plant. Seven other men were arrested in connection with the probe and then released without charge, police said. Caruana Galizia’s family, which has criticised the handling of the case, said in a statement on Wednesday that the murdered journalist had not been investigating any of the 10 people arrested. 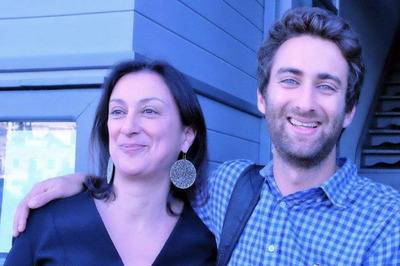 FacebookDaphne Caruana Galizia and Matthew Caruana Galizia. Prime Minister Muscat has called the killing an attack on press freedom, and asked the US Federal Bureau of Investigation to help local police investigate. Members of European Parliament who recently visited Malta on a fact-finding mission said they arrived “seriously concerned” about the rule of law on Malta and left “even more worried,” according to The Guardian.